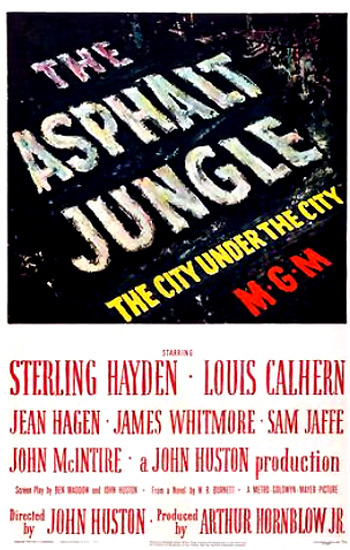 The Asphalt Jungle (1950) is a naturalistic film noir crime film classic (resembling numerous B-films) of the early 1950s from A-list director John Huston. The realistic, documentary-like, urban crime/heist film - advertised as "A John Huston Production" - was one of the first films that completely and specifically detailed how to pull off an authentic-looking heist - something usually considered morally improper under the Production Code. The same storyline was also used in three other films: the jewel heist caper Cairo (1963) set in Egypt, Cool Breeze (1972) with an all-black cast, and the Delmer Daves western The Badlanders (1958) with Alan Ladd. The members of the gang are not one-dimensional, like the amoral gangsters in The Public Enemy (1931) or Scarface (1932), but proud professional men who have turned to theft. And the women are not alluring femme fatales. The ambitious plans of the minor-league, commonplace criminals in the city's underworld (a tagline from the film's poster reads: The City Under the City) are doomed to inevitable failure, although they are not led to their doom by the women in this noirish film. By this time, oft-nominated Huston had already directed some of the finest films ever made in the 40s: The Maltese Falcon (1941), Key Largo (1948) and The Treasure of the Sierra Madre (1948) (he won an Oscar for Best Director and Best Screenplay), and in the next year he would direct the classic The African Queen (1951). The film was remade or refashioned three times - Delmer Daves' turn-of-the-century Western gold robbery titled The Badlanders (1958) with Alan Ladd and Ernest Borgnine, the robbery of King Tut's treasures in the Cairo Museum in the British film Cairo (1963) with George Sanders and Richard Johnson, and a diamond robbery in the all-black film Cool Breeze (1972) with Thalmus Rasulala and Judy Pace. Anti-hero Handley enters a cafe identified as serving "American Food - Home Cooking." The diner operator, a hunchback named Gus Minissi (James Whitmore), cooperatively hides Handley's gun ("heater") for him in the luncheonette's cash register just before the police enter and book the tall drifter as a vagrant. In a lineup with two other suspects who have recently been arrested, the grim, dirty-shaven, Irish-American Handley is identified as a 36 year old, out-of-work ex-con with a previous arrest in 1937 for illegal possession of firearms. During a one to five year state prison term, he escaped in 1939 and was re-arrested in 1940 and released in 1941. Police Lieutenant Ditrich (Barry Kelley) cannot coax an identification from an eye-witness who suddenly has developed "cold feet". When the witness is hesitant about identifying the cold-staring Handley, he fingers his collar / tie as if knowing that identifying him would be suicide (his telltale gesture is similar to what the short narcotics dealer suspect in the lineup did who attempted suicide using his necktie the night before - adjust his shirt collar). The suspects are dismissed from the "show-up." Police Commissioner Hardy (John McIntire) wrathfully blames his lieutenant [a corrupt, two-faced, on-the-take officer] for a rise in city crime: "39 thefts, 33 burglaries, 18 robberies, 7 assaults, 5 morals offenses in the past thirty days. Quite a record, even for the 4th Precinct, Lieutenant Ditrich." Hardy also criticizes his officer for overlooking the rampant bookie and horse-gambling operation in his own precinct - he suggests harsher tactics: "You don't close 'em hard enough. Rip out the phones, smash up the furniture." Another former con, "Doc" Erwin Riedenschneider (Sam Jaffe), is reported to have left state prison a day earlier en route to the city, but the Lieutenant was also lax in trailing the recently-paroled criminal: "He loses you five blocks from the depot and one of the most dangerous criminals alive is now at large in this city." Ditrich is given "one more chance to make good" on his responsibilities. Well, here's to the drink habit. It's the only one I got that don't get me into trouble. "Don't bone me!...Did I ever welch?...You just boned me...I'm not askin' you any favors. I'll go getcha your twenty-three hundred, right now." Back in the diner, Gus strokes a milk-sipping cat on his greasy-spoon counter and shows his love for animals when a truck driver patron speaks about his love of running over cats ("I run over one every time I get a chance. Some people feedin' cats and some kids haven't got enough to eat"). Gus tosses the customer out by his coat-tails, threatening: "If I ever see you runnin' over a cat, I'll kick your teeth out." After promising to loan $1,000 to Handley so he can pay Cobby, heart-of-gold Gus also advises his loner pal to lay off holdups for a while, due to recent step-ups in police efforts to curb crime on the boulevard: "Take my advice and knock off for a while. The happiness boys are on a rampage. Headquarters is givin' 'em a push...Go home, Dix, stay home. Don't get your flag at half-mast. Remember, you still got ol' Gus." The third burglar who will eventually join Gus and Dix in Doc's assembled ring of caper thieves is introduced by Gus' phone call to Italian-American family man Louis Ciavelli (Anthony Caruso). He is a professional safecracker who admits that he can't lend Handley the balance: "I've got mouths to feed and rent to pay, and all that stuff." But then, after closing the door on his wife Maria (Teresa Celli), who is rocking their crying infant in the background, he reverses himself: "I guess I can make it all right." Dix's eager-to-please-and love, tough-girl moll Doll Conovan (Jean Hagen, who would soon play her career's definitive role as Lina Lamont in Singin' in the Rain (1952)), who has been "locked out" of her lodgings (at the "clip joint" - the Club Regal) due to a police raid, seeks shelter in his place. As her mascara runs down her fluttering, teary eyes with false eyelashes, he consents for her to stay. But afraid to encourage her and show any emotion, he warns in his typical monotone voice: "Don't you go gettin' any ideas, Doll." Emmerich also has an expensive, high-living lifestyle to maintain for his own fatal flaw - a blonde, childlike companion named Angela Phinlay (Marilyn Monroe in a minor but significant star-making role) - she pretends to be his 'niece' (a 50s' euphemism for mistress) and calls him "Uncle Lon." She is resting on his sofa in another room. He compliments and describes Angela as "some sweet kid," giving her all that she requests. He appreciates her thoughtfulness to order "salt mackeral" from the market, his favorite food for breakfast. She kisses him, falls into his lap, and then goes off to her private bedroom. While gazing at one of her sparkling high heeled shoes, he phones Robert Brannom (Brad Dexter), a private detective that he hires to collect about $100,000 owed to him by debtors: "Use the method called for in each particular case and don't tell me anything about it. All I want is results."